Sometimes when I’m not sure if I’m going to be able to use vegetables or herbs before they go bad, I stick them in the freezer for soups, casseroles, sauces, pizza and things like that. I had a can of salmon, some rice and Quinoa mix and wanted to make a casserole, so I looked in the freezer and found some spinach, parsley, green beans and sweet peppers. Perfect! First cook the rice and/or quinoa. I cooked mine with homemade vegetable broth for extra flavor. Place the cooked grains in a large bowl and stir in the cream of mushroom soup, without water added. Open the can of salmon and drain the juice into the grain mixture. Spray a large glass baking dish with cooking spray and arrange vegetables and herbs over the bottom of the dish. Pick apart the salmon to find the vertebrae and discard those. Arrange salmon pieces on top of vegetables. Cover all with grain/soup mixture. Top with cheese slices. Cover dish and bake in oven for 45 minutes at 350 F degrees. For more recipes go to my Fun With Food page! 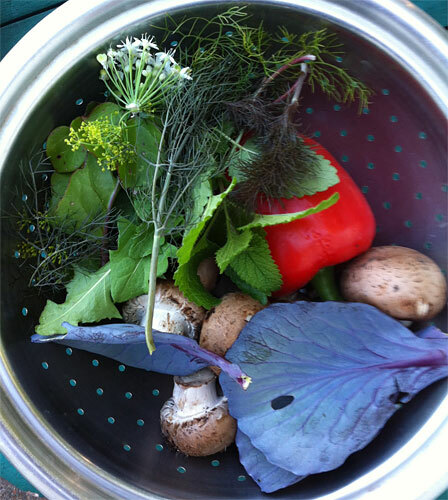 In 2013, my Dad expressed an interest in expanding his garden and growing some vegetables organically. We put our heads together and came up with the following strategy – in 2013 we would make his yard a better habitat for beneficial insects, then in 2014 we’d start planting vegetables. With a healthy beneficial insect population in place, we should have a better chance of getting any pest problems that might manifest on the crops under control in a natural way. Another goal we have is to be as frugal as we can – we both read The $64 Dollar Tomato and we hope to produce vegetables at a more reasonable cost than that! Neither of us have much experience growing vegetables organically. I’ve been gardening organically for about 10 years but where I live I don’t have enough sun or space to grow most vegetables so I have concentrated on herbs and flowers. We will both be learning a lot as we go – some of you more experienced gardeners out there might find some of our actions strange, if so don’t be afraid to offer feedback! We know we have a lot to learn! Most of the vegetables we plan to grow are going to be direct-sown into the ground. It was too early to plant yet on March 30, so we worked on garden prep. 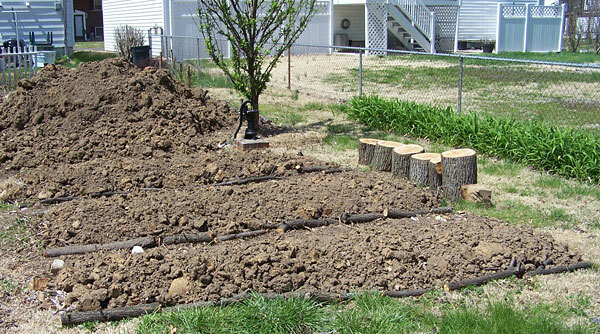 We are going to attempt to use a form of permaculture gardening called the Hugelkultur method to build raised beds. 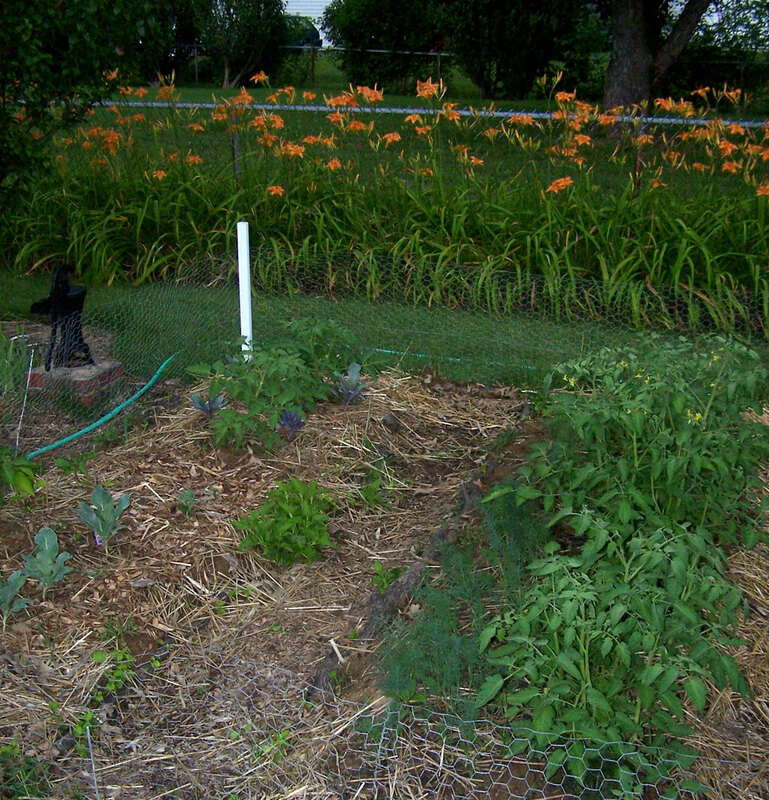 One of our ideas is to put a chicken wire fence around the vegetable garden area to keep the rabbits out. Last fall Dad had done some pruning on some of the bushes and trees and left the cut branches lay where they fell during the winter. This was a good idea for two reasons – one, the birds were able to eat seed from the branches if they wanted (some of them, like the Rose of Sharon, had a lot of seeds which I’ve observed being eaten by house finches, gold finches and starlings), and it caused fallen leaves to gather among the branches which helped keep the ground warm and moist around the shrubs and trees during the harsh winter we had. We gathered up these branches and started building long mounds for our raised beds. We added some compost in various stages of completion and some more organic material. After the fence is erected, we plan to add more woody material, leaves, organic matter and top it off with soil. The walking paths between the planted mounds will be mulched. There is an area of Dad’s garden where we plan to plant a wildflower seed mix. In preparation, in the fall Dad spread leaves over the area we’re going to plant – we plan to put soil over the leaves before planting. Dad was pleased to observe that he had inadvertently created a well-used foraging area for birds who love to turn the leaves over looking for insects. A neighbor of mine was giving away free wood from a cut tree so I filled the back of my Jeep with bundles of this wood and brought it over to Dad’s house. Perhaps we’ll use this to make walls around the raised beds to hold the soil in. 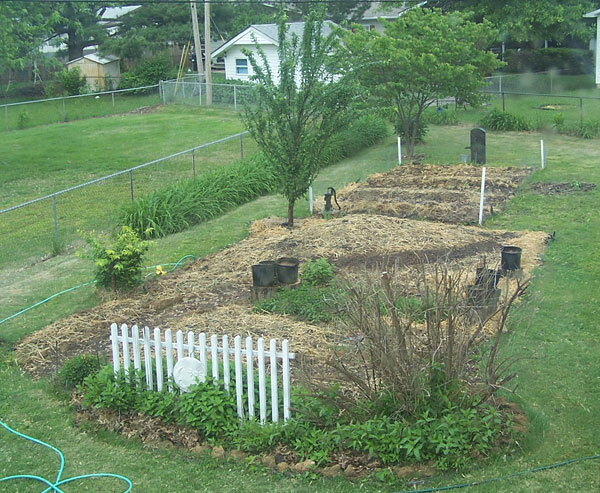 Or if we decide to build a chicken wire fence around all the raised beds, we might use the wood to reinforce the fence. This was a pretty cold day, so after unloading the wood and some extra unfinished compost I brought over to help build up the raised beds, we retreated to Dad’s basement where I spent the afternoon sewing on what had been my Mom’s old machine and he planted tomato, cucumber and spinach seeds in little containers to sprout indoors on a windowsill for transplanting outside later. 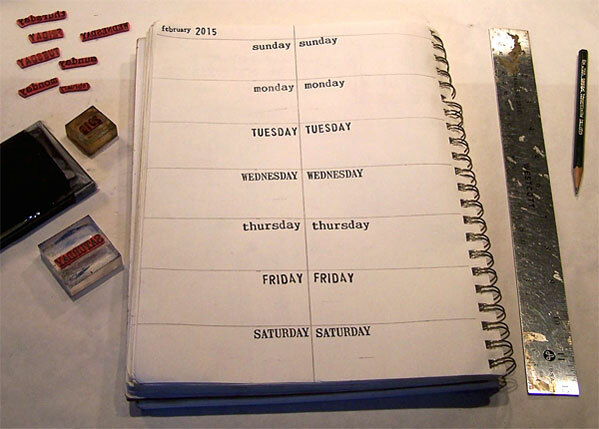 We both agree it’s probably a little late to start that but we’ll just do the best we can with what we have. 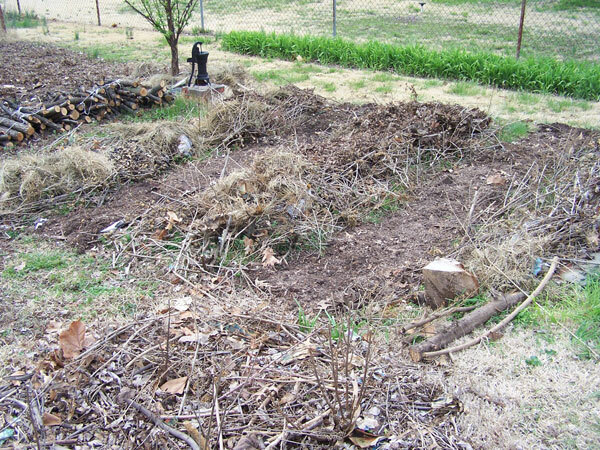 The Hugelkultur method is supposed to warm the raised bed and extend the growing season. We’ll see if it works! My own garden is mostly perennials. It’s great fun at this time of year to see what comes back. Things are a little behind schedule this year but there is evidence that a lot of plants are still alive! Dad has lots of cucumber and tomato seedlings coming up indoors! The final decision has been made on how to protect the vegetables – we’re going to fence in the vegetable area with chicken wire and reinforce the fence with wood and repellent plantings. I brought over some more organic material to help build up the raised beds that will grow the veggies. The neighbor who was giving away wood earlier still had some large stump sized pieces left, so I brought some of those over too. We’ll use those to put containers on if we need more space for plants that need to be raised above rabbit level. After unloading these materials, Dad and I headed over to a home near Dad’s where a man recently had a large stump ground down and was giving away a quantity of wood chips. We filled up many containers of this to use as mulch. 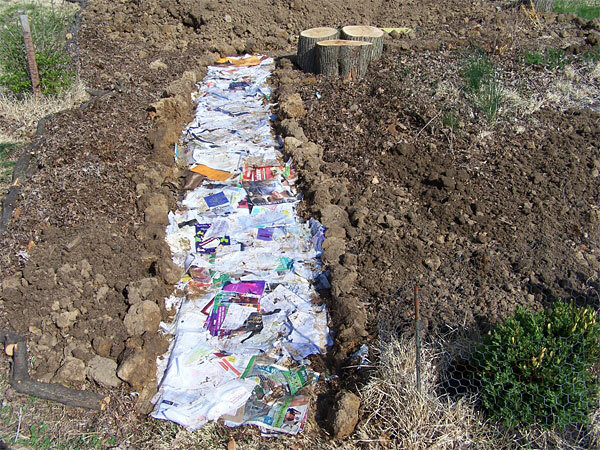 We started figuring out where we wanted walking paths in both the vegetable and herb/wildflower areas and we put the mulch down over scrap cardboard and paper to help hold back the grass underneath. Dad thinks his flowering fruit trees are growing more vigorously this year. We hope that means the compost and mulch we put down at their bases last year is paying off! We still haven’t put down enough material to smother all the grass to the drip line, but we’ll get there someday! I think we’re done with freezing weather for this year (I hope I’m right!) so I put away my “pond” heater (I have a 1/2 barrel water feature on my deck) and planted some seeds on containers on my deck – grape tomatoes, wheatgrass, bronze fennel, mullein and sweet basil. Most of my garden plants are perennials so there isn’t much to do in the rest of my garden yet. Yesterday I dug up some extra volunteer plants to give away and sell at the various shows and farmers markets I’m going to do this year. So far I have quite a bit of extra lemon balm and garlic chives. In anticipation of receiving a shipment of dirt, Dad bought some manure and spread it over the mounds of woody material and unfinished compost that will become the vegetable beds in his garden. The new dirt arrived on the 19th and was deposited on what will become the wildflower section of Dad’s garden. It’s up to us to spread it around where we want it. Dad filled in the future vegetable beds with dirt. On Easter Sunday, my Dad, brother and I attended mass together then went out for brunch at Yacovelli’s which is sadly now closed. When we got back to Dad’s house, we changed into old clothes and went to work on the garden. Dad surrounded the new vegetable garden area with chicken wire fencing while I got to work on the dirt pile. First I loaded up two carloads full of dirt that we are going to give to a friend of ours who also hires me one day a week to help him with his garden and with various things around his house. Dad is going to deliver one and I’m going to bring over the other. Then I started distributing more dirt to the wildflower and herb portion of the garden. Some plantings are already in place in this section. I took some chunks of dirt that were hard to break apart and used them to mark the boundaries of paths, the garden edge, butterfly puddle area and herb beds. I put down some more recyclable paper and cardboard on the paths to keep the grass from coming up after they are mulched and started to fill in the wildflower area with dirt. Dad moved the stump pieces we had collected to various locations to later put containers on. The last thing we did this day was to head over to the man’s house near Dad who was giving away mulch. It didn’t look like anyone had taken any since we had been there the previous week. Since my Jeep and Dad’s car were already full of dirt containers, we took my brother’s car over there and filled many grocery bags with mulch. By the time we covered the new paths and touched up some mulched areas from last year, we only had two bags left. We put that aside for later because we know there are areas that will need periodic touching up. We think the paths really help improve the appearance of the wildflower garden and make it look like an inviting place to explore. The paths will also make future maintenance easier – we’re going to be going in there for weeding and harvesting herbs! There may still be some dirt left after we’ve used all we can and in that case we might make a berm for the wildflower seed mix portion of the garden. That could be very interesting because different seeds might sprout at different levels if the moisture level is not consistent throughout. I came over to Dad’s house after my stint at the Tower Grove Farmers Market in the morning. I was a bit tired and Dad was working on a car so I just did a little weeding. Dad had finished distributing the dirt in the meantime so it’s ready for planting whenever we have the time to do it! I worked on my own garden on this day. I loosened up the soil in several spots and planted the following seeds – Mullein, Forget-Me-Not, Cilantro, Flowering Tobacco, Blackberry Lily, Queen Anne’s Lace and Columbine. Direct sowing seeds right into the ground is kind of a hit and miss method for me, but I’m out of room on my deck for containers so we’ll see what happens! While loosening the soil I collected all the grubs I could find to feed to my two pet starlings – that is one of their favorite foods! I gathered up handfuls of earthworms and put those in my deck containers which have a lot of partially finished compost in the bottoms under the soil. We were determined to finish all the planting in Dad’s garden on this day, and we did it! First we planted some extra seedlings that I brought over from my own garden – grape tomatoes, bronze fennel and Korean hyssop. Next we tackled the seeds we’d accumulated over the last several months. Some were seeds saved from previous years and some were collected at plant and seed swaps. I guess it’s not very realistic to expect them all to come up but we are excited about possibly enjoying leeks, watermelon, sweet basil, cucumber, onion, Summer savory, 4 O’clocks, Hollyhocks, Tansy, Baby’s Breath, Morning Glory, Sumac, Annual Sunflower, Cantaloupe, Cosmos, Coreopsis and a wildflower mix which has too many things in it to list them all here. On Sunday the 18th, I attended a plant swap and picked up some extra plants for my garden and for my Dad’s garden. I scored some Mountain Mint, Solomon’s Seal and Parsley for my own garden and several plants that I’m going to give to my Dad. Well, I was wrong about having all the planting done due to having picked up new plants at the plant swap. 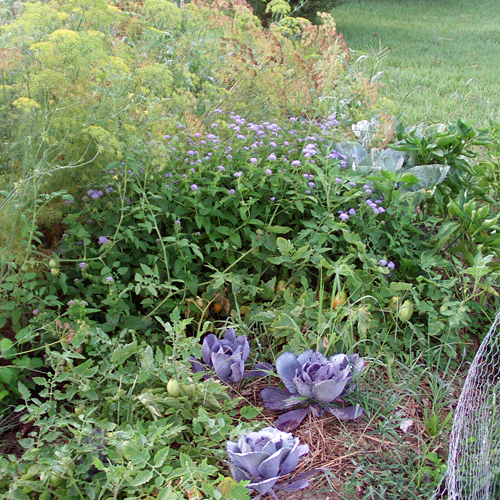 To Dad’s garden we added elderberry, foxglove, collards, cauliflower, red cabbage, moonflower, and a romaine lettuce that I had started at my house from the cut-off stem of a romaine lettuce bunch. Brought Dad a another romaine lettuce and a celery for him to plant, both started from cut-off stems. Whew! Reading this over again many months later reminds me of how much work we put into Dad’s garden! I was correct in predicting that not all the seeds we planted would come up, but enough did to make the effort well worthwhile. Nearly all the transplants did very well. Dad was not able to stop buying vegetables in the grocery store (not that we were expecting that), but a reasonable amount of vegetables and herbs made it to his table. I’ve read that the area dedicated in the garden to flowering plants should be equal to the area planted with vegetables in order to provide a sufficient beneficial insect population for pest control and pollination. 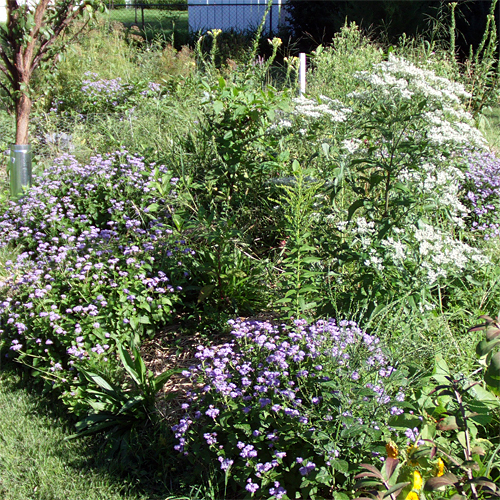 Dad’s wildflower and herb area was the right size and worked as planned – there were almost no pest issues at all and the plants in the wildflower and herb area were the site of constant activity from beneficials. I counted 12 beneficial wasps on a single plant on one occasion. Some of the herbs, like the bumper crop of dill, were in the vegetable area and their masses of tiny yellow flowers were gorgeous to look at while performing their valuable function. Since there had been a new application of unsterilized soil over the garden, a lot of weeds came up. I was expecting this and kind of looking forward to it because I was hoping some of them would be useful – such as purslane, which we got – yay! We let things grow for awhile then when the plants were big enough to tell what they were, we pulled the ones we didn’t want. For example, we pulled out some of the pokeweed and let some stay since they are pretty plants and serve as bird food. There was one unknown good-sized white-flowered plant in particular that I really want to know what it is because it’s very beautiful and was swarming with beneficials. We let those stay as well. This year we are going to plant more wildflower seeds in this area to supplement last year’s wildflower mix, which mainly produced evening primroses. These are biennials so I sure hope they keep re-seeding! We were both really pleased with the appearance of the wildflower and herb area as well. The combination of flower colors (mainly yellow, white and purple) was stunning and the berm left over from our dirt application and the mulch paths really added to the attractiveness of that part of the garden. The butterfly puddling area we had built in 2013 didn’t seem to be holding any water and we never saw butterflies using it though there were plenty in the vicinity. We may have to dig that up and rebuild in the future with a better water collection container. To overwinter the garden, we didn’t do much to the wildflower area except to mulch now and then where there was bare soil or when any of the cardboard under the mulch got exposed at the edges. Dad put the leaves he collected in the yard in the vegetable area to protect it and use as mulch the next year. Since that part of the garden is fenced, the leaves stay put until we need them. On February 8, 2015 I came over with some leaf and wood chip mulch that I had picked up at the Richmond Heights mulch pile the day before and we touched up the mulch where needed. Dad also had on hand a supply of wood chips that came from a ground up-tree that had been taken down at a rental house that he owns. We also put down cardboard and paper over the path areas of the vegetable garden, without removing the leaves first, and covered that material with wood chips to form this year’s paths. We had some wood chips left over so we stored those for future use. Our gardening method requires lots of mulch so we know it will be used eventually. We are leaving last year’s plants standing until it’s time to plant those particular areas. At that time we’ll also remove some of the leaves from the raised beds and compost them in another area of the garden and also leave some as mulch around the new plants. Since we are using a no-till method we will not be disturbing the planting mounds from last year but instead just planting on top of them. This will require a fresh infusion of soil – we are not sure what our source will be for that yet. We won’t need nearly as much as last year, no need for a truck to bring it this time! A carload should be more than enough. 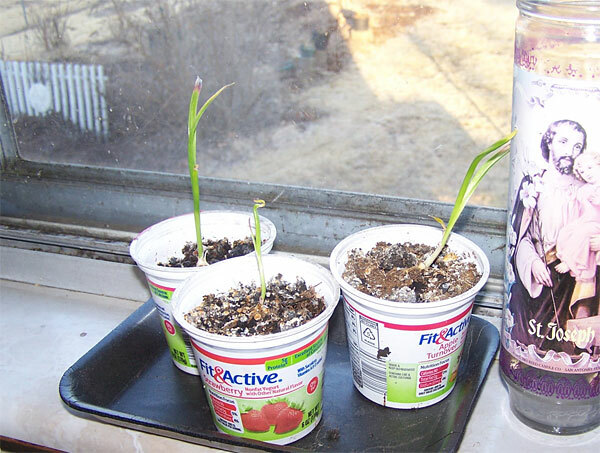 Dad has some garlic bulbs started in the house, and will be starting seeds indoors shortly as we get closer to planting time. 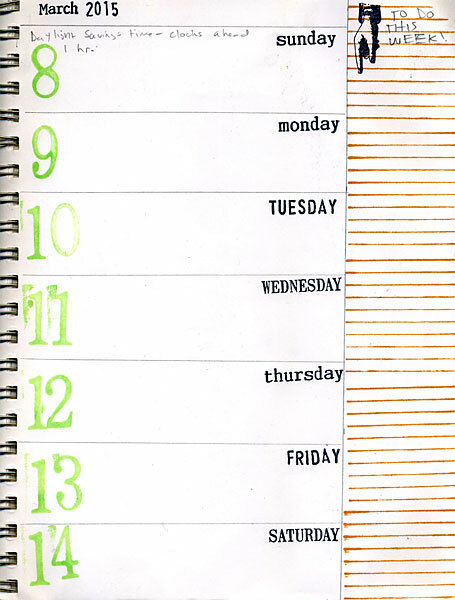 Here is a planting calendar I made for the St. Louis, Missouri area that we are attempting to follow. We’re hoping that last year’s hard work will pay off even more this year! It’s late winter here in the St. Louis, Missouri area and we’re having an unseasonably warm weekend – not that I’m complaining! This is a good opportunity to look over my garden while the ground is relatively bare and make plans for the coming year. 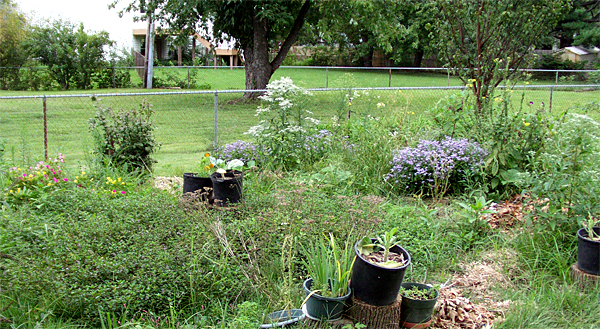 Every garden has it’s own challenges – I started my current garden in January of 2005. My main goals for this project were to grow some culinary herbs and do my part for the environment by managing my garden to benefit wildlife and have a positive impact on the local water, air and soil quality. When I started the only plant growing in my garden was liriope – a nice plant but not that interesting by itself. I have made a lot of progress. I have found a number of plants that will grow in my part shade conditions. I have built raised beds filled with imported soil, sand and masses of organic matter over the mixture of clay and construction debris that passed for soil before I started. 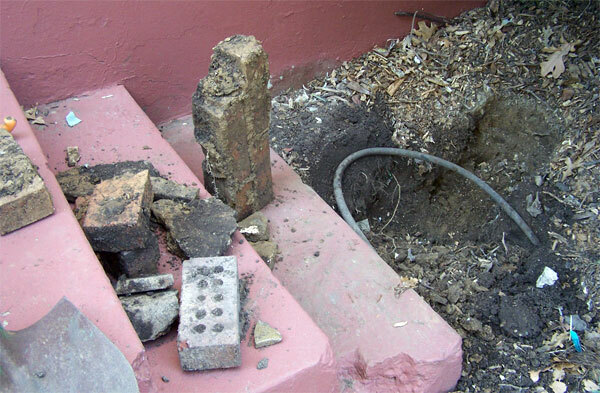 I have excavated buckets full of bricks and other debris. I have installed connected soaker hoses under all the beds to make watering easier and less wasteful. I don’t have all native plants but I have planted some as food for native wildlife. I have attracted a population of birds and beneficial insects that do nearly all of the pest control for me. Japanese Beetles and Eastern Tent Caterpillars are no longer a major plague on the flowering trees outside my bedroom as they were when I first moved here. There is still a lot of room for improvement. I live in a condominium and I’m fortunate that the condo owners’ association lets me garden at all. My unit is on the ground floor and on the end, so I’ve claimed three sides of that end of the building for my garden which gives me quite a bit of linear space. I’ve let my near neighbors know that they can garden there if they want because I don’t own the space, it’s common ground, but none are interested so for now that’s my garden. I imagine most people live in condos because they don’t want to bother with yard work and things like that, but some of us in the condo complex do garden, we even had a garden club for awhile. I’d much rather work on a garden – for me it’s a hobby – than maintain lawns or shovel snow so I’m happy to let others do the maintenance type things outside while I do the creative stuff! My gardening style is different from how most of the rest of the condo complex is managed. I prefer the permaculture way of management. I like to plant mostly perennials and leave them standing until late winter for wildlife habitat and food, while the landscaping company employed by the condo complex likes to plant a lot of annuals and leave large patches of ground bare in the winter. I don’t think they object to what I’m trying to accomplish, the property managers seem to be wildlife friendly, but it’s taken some time to get them to understand what I’m doing. Wildflowers, native plants and herbs look unusual if everyone else in the vicinity is growing hostas, begonias and impatiens, I understand that. One of the major problems my garden has is that it looks sloppy in winter. Having a garden that looks good all year in a continental climate is really difficult even when you have complete control over your space. I think leaving perennials stand in winter is much more attractive than bare ground, and the local birds benefit from the resulting cover and food. This practice is good for the health of the garden also – it keeps soil from washing away, helps maintain the fungi, bacteria and tiny animals that keep soil healthy, provides shelter for new seedlings to increase the number of plants available and the standing plants serve as overwintering places for beneficial insects. Unfortunately when the landscapers come by with their leaf blowers, the standing plants (if they are still standing) end up looking bedraggled and beaten up and a lot of the mulch I put down gets blown away. Some of this mulch ends up in the grass which does not help the already struggling lawn. By far the best thing for my garden would be for the leaves in my garden to be left alone – I’d have less dieoff of plants over the winter and the soil would be much healthier both for my own plants and surrounding trees in the lawn – but I don’t know what my chances are of persuading the management go along with that. I do have a proposal that I’m going to run by them for leaf management in my garden next fall and it remains to be seen if they’ll go for it. In the meantime, how can I make my garden look neater? One problem area is the ground around my Rose of Sharon (Hibiscus syriacus) bush. If you have one of these plants, you know they are very prolific seeders. There are positive aspects to this – I’ve observed three species of birds eating the seeds and the abundant flowers attract masses of bees, butterflies and hummingbirds – but you do have to keep up with the extra seedlings! I’ve been unsuccessful so far in getting much else besides Rose of Sharon seedlings to grow under there so for now I’m going to put down some cardboard, paper, and other biodegradable barriers to kill off last year’s seedlings, add a layer of dirt, and mulch the heck out of it so it’s not unsightly. This is my favorite method of weed control – much better than poisoning the ground! There are a few Blackberry lilies hanging on somehow there and if my memory is correct some irises also so I’ll go around those so they don’t get smothered. 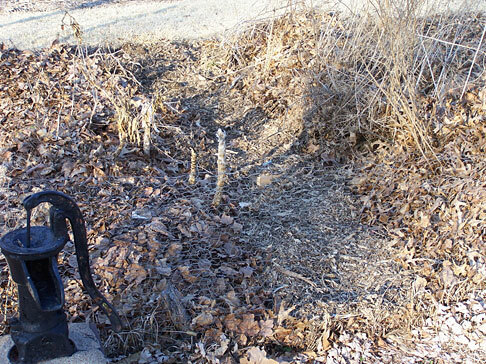 My “dirt mine”, with temporarily unburied section of soaker hose – also a brick mine! This task ended up consuming much of the day – one reason is that my source for the dirt was to dig a large hole in an area I use for a “dirt mine”. I needed a lot of dirt so I dug the hole bigger than I ever have before and as a result ran into a lot of construction debris which took some time to dig out of the heavy clay. This is not all bad – free bricks are handy for shoring up raised beds and I think I have a plan for the large flat rocks! Stay tuned for the next garden improvement!